New data on paper and steel point to a peak in material consumption. John Quiggin has a piece up reporting that the world passed Peak Paper in 2013. [Update 22/2: updated version on his blog.] World consumption is now falling. Later than enthusiasts predicted, the shift from paper to electronic communication has finally started to happen. In many workplaces and homes, paper copies are becoming afterthoughts for archives, not the prime media of current work. What about scissors? 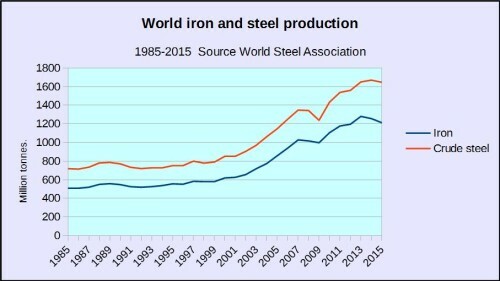 Iron and steel production has also peaked, and in the same year. The iron total is the new metal smelted from ore, in blast furnaces or to a limited extent by direct reduction with gas. The rest of the steel is made from recycled scrap, in electric arc furnaces. Only the former is an issue for sustainability. Recycled steel is cheaper, though of slightly lower quality because of the random admixture of paint, plastics, other metals, used condoms, dead rats, etc. The average age of scrap will be several decades, so its volume can be expected to double over the next 20 or 30 years, driving down the need for primary iron by itself by about another third. Peak iron was in 2013 at 1,281 million tonnes. In 2015 it was 68 million tonnes lower, or 5.3%. Is there any reason not to interpret this as a long-term peak? Nothing special happened then to throw the data off trend. There wasn’t SFIK any policy in China or anywhere else to cut iron smelting. In 2014, global coal consumption stopped growing for the first time since the 1990s. The slight decrease (-0.9% or -71Mt) contrasts sharply with the 4.2% average annual growth of the last decade. However, the result should be viewed cautiously, as the main driver was a decline in Chinese demand that is based on preliminary data. 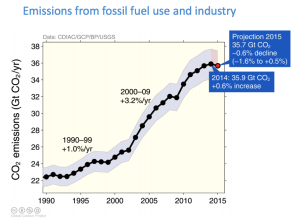 Global CO2 emissions from fossil fuels and industry probably peaked in 2014 (Tyndall Centre).Â The data on land-use emissions are poor, and it’s just possible that deforestation and poor farming outweighed the fuel drop, but it can’t be by much. I don’t know about peak stone. Some of it â€“ sand and rock for construction â€“ does not matter at all. Limestone for cement is plentiful; the constraint is the re-release of carbon. Metal ores are also unlikely to be a problem, in the context of a slowing demand for manufactures and high recycling. Fusses over limited mineral reserves (lithium! rare earths!) ignore the fact that it costs mining companies money to prove reserves to the satisfaction of stock market regulators, so they only do this to anticipate demand. The picture is shaping up of a turning point in material consumption, the Great Inflection. The data are not conclusive, but still strong evidence. The synchronised timing cannot be coincidence. To call the turning-point historic would be to understate, since the ever-rising use of primary resources has been a feature of the human economy since the Neolithic revolution in prehistory. When did iron production fall in the last millennium, apart from wars and plagues? In my last post on Peak Stuff, I had to walk back an earlier optimistic claim, following new research by Thomas Wiedmann that found no acceleration in decoupling of growth from material consumption in the last decades. But I think I can now safely reverse myself again – one of the privileges of amateurism. I think Wiedmann’s paper must be wrong as prognostication. His analysis runs only up to 2008, and does not cover the crucial last few years. Data are king, and they are beginning to point to an inflection. 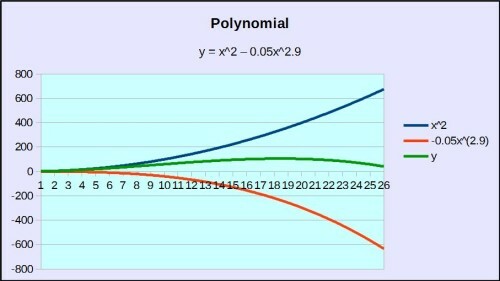 Notice that the second negative term has to be a power of x higher than the first â€“, in my example 2.9 rather than 2. Now you tell me if any statistical analysis of a noisy time series can reliably test for the existence of such a inhibitory signal before the maximum. If you are sure a priori that it’s there, you may be able to fit an equation, but even that must be very chancy. I conclude that in practice a historical analysis like Wiedmann’s or Steinberger’s is not in principle capable of predicting an inflection before it happens. (Comments from readers with more statistics chops than me will be welcome). Candidates for the inhibitory trend are not far to seek: the diminishing marginal utility of stuff as opposed to information and services; rising efficiency in production and use of stuff; higher quality and durability of stuff; slow-acting policies; new resource-light technologies like wind and solar energy; the demographic transition. The real equation, if there is one, will have many terms. The one plausible counterargument is Chinese exceptionalism. The recent reductions in coal, steel and carbon emissions are all driven by China rather than the more or less static rest of the world. On the other hand, recent growth in material use was also driven by China too (see Wiedmann). China is now the resource consumption Godzilla, deeply meshed with the rest of the world, and there is no point in imagining the world economy without it. If India or Africa ever catch up, they will presumably follow something like China’s path â€“ but drawing on its experience and the much more frugal technology now available. Peak Indian coal is already in sight. Do you think India will ever have many more than the 15 million gasoline-fueled cars it has today? This may be something to tell our grandchildren, who if we are lucky will only laugh at our wastefulness. I've been appealing to every business and colleague to only send me electronic files. I finally got the legal people to send me links instead of dead trees, and so on. It's taken several years of work to get to this point, where I only have to scan and shred 30-40 documents (bills, contracts etc) each week. Each week! I have no idea why everyone resists this so strongly. I get why you would want hard copy signature pages, although DocuSign and its ilk are fine for me, but if you have a 30 years financial accounting of a brokerage account (1300 pages) why do you insist on sending it to 30+ people by FedEx? Given that commodities have decades long supper-cycles, it can be difficult to know before hand what is a peak or just another stage in the supper-cycle. We have likely reached peak farmland with increasing acreage being returned to nature and other purposes in the coming decades. If not for the production of ethanol, this trend would be even greater. Aren't commodity cycles mainly on the supply not the demand side? Price of copper goes up. new copper mines are opened, oversupply at low marginal cost crashes the copper price, no new mines are developed, demand catches up, price rises, rinse and repeat. Steel and coal. let alone paper, aren't like that, it's very easy to adjust output to demand and the marginal cost is higher compared to the sunk cost of capital. For the first two, holding large stocks is expensive.